Sponsoring your spouse to Canada can be an overwhelming and stressful process, especially because you desperately want to be reunited with your significant other. But ultimately the decision is in the hands of the Immigration officer. As a result, you must provide sufficient information and documentation to prove your relationship is genuine and that you meet all of the eligibility requirements of a spousal sponsorship application. However, even if you’d tried your best to submit all of this information, Immigration officers still have the discretion to refuse the application. 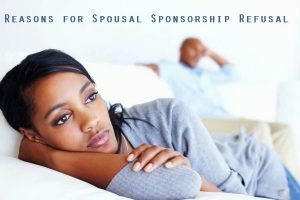 Therefore, in this article, I will address reasons for spousal sponsorship refusals and important information you should consider if you are going to re-apply for spousal sponsorship. Spousal sponsorships are quite beneficial to Canadian society because it allows for Canadian citizens and permanent residents of Canada to reunite with their families permanently in Canada. The Canadian government truly believes in family reunification. That is why every year, Canadian Immigration receives thousands of spousal sponsorship applications. However, not all applications are approved. Specifically, the processing time for spousal sponsorship applications can range from a couple of months to years, depending on the information submitted to Immigration. Many times, Immigrant officers run into issues with spousal sponsorships with regards to fraudulent applications. There are many individuals who participate in false relationships and marriages in order to obtain permanent residency in Canada. Consequently, Canadian Immigration as well as the Canadian government has revised the policies and conditions for spousal sponsorship to make it much more strict and complex. This was done with the intention of preventing fraudulent marriages from coming to Canada. One of the ways that Canadian Immigration ensures that spousal sponsorships are valid and real is when they appear without notice at a couple’s home to make sure that the couple is living together and are in a relationship. They can arrive at the home any time between the day that the sponsored applicant receives permanent residency in Canada and three years after this date. The undertaking of a spousal sponsorship lasts for a total of three years. In other words, spouses must financially support their sponsored spouse for a minimum of three years as per the undertaking contract. Therefore, in order to further understand how spousal sponsorships work, it is important to determine why spousal sponsorships are refused by Canadian Immigration. If you were sponsored to come to Canada for permanent residency in the past, it is very important to make sure that the appropriate time has passed since your sponsorship. Specifically, you must ensure that five years have passed since you were sponsored, in order for you to go ahead and sponsor your spouse. Ultimately, the spousal sponsorship will be returned or refused if Immigration determines that five years have not elapsed since you were last sponsored. Therefore, it is best to make sure that enough time has passed before you sponsor your spouse. If you are a Canadian citizen or a permanent resident in Canada and you have received social assistance from the Canadian government, unfortunately, you will not be able to sponsor your spouse to Canada. If you submit a spousal sponsorship application, the application will be refused and possibly returned to you. The reasoning behind this rule is because Canadian Immigration needs to ensure that the sponsor is financially capable of supporting the sponsored spouse. The financial support would include basic necessities, including health care, dental care, and any other expenses that may occur while the sponsored spouse is in Canada. Furthermore, if a sponsor has received social assistance, they will most likely not have sufficient funds to support their spouse. If a Canadian citizen or permanent resident of Canada has previously sponsored someone in the past and they did not fulfill the sponsorship requirements, then they would not be able to apply for another sponsorship. If you submit a spousal sponsorship under these circumstances, Immigration Canada will refuse the application. For instance, if the sponsor lost their employment and did not earn the same funds as before and was not able to financially support the sponsored person, then this would result in not fulfilling the terms of the sponsorship undertaking. However, there is a way for the sponsor to be able to sponsor their spouse. So long as the sponsor can demonstrate that their circumstances have changed since the last sponsorship, Immigration may take this into consideration for this current application. Immigration Canada must ensure that the sponsor can financially support the new sponsored spouse. Similar to the sponsorship requirements, a Canadian citizen or permanent resident of Canada will be refused of their spousal sponsorship application if they missed any payments on an Immigration loan. Financial capabilities are a very important factor in spousal sponsorship applications. Therefore, if you have received an immigration loan in the past and you have either missed payments or have stopped paying, this can truly increase your chances of having the spousal sponsorship application refused. If this is the case, you must provide sufficient evidence to indicate why you missed payments or why you have stopped paying. You can provide proof of income to show this or show sufficient funds to indicate that you will pay the loan. Ultimately, the Immigration officer must be confident that you will be able to financially support the sponsored spouse. It is essential that you have met all of the aforementioned requirements before you attempt to apply for a spousal sponsorship. This is especially the case if you have applied for a spousal sponsorship in the past and it was refused. Spousal Sponsorship applications are difficult applications to pursue on your own and it is highly recommended that you seek out professional and experienced help before attempting to submit the application. Here, at Akrami & Associates, we work and have experience with many different immigration issues. We have helped many of our clients obtain permanent residency in Canada through the spousal sponsorship. If you believe that you may be eligible to sponsor your spouse, please feel free to contact Akrami & Associates at our office at 416-477-2545 for more information or if you would like to book a consultation with an immigration professional for more advice.